Creamy Mint is classic mint flavor with a touch of cream. This pod is designed to work with the Cue Vapor System only. Creamy Mint is by far the best Cue flavor. It's a blend of the Vanilla Cream flavor and the Menthol Tobacco flavor, minus the tobacco. I don't really like the Menthol Tobacco flavor because the tobacco tastes like burnt chemicals, so I would love it if they made a pure menthol flavor without tobacco or any other flavors. Creamy Mint is the closest thing to that. It's more cream than mint though. The creamy part is based on the Vanilla Cream flavor, which tastes more like a banana split with coconut ice cream and sprinkled with graham cracker crumbs, which is delicious, but it doesn't really taste like vanilla. 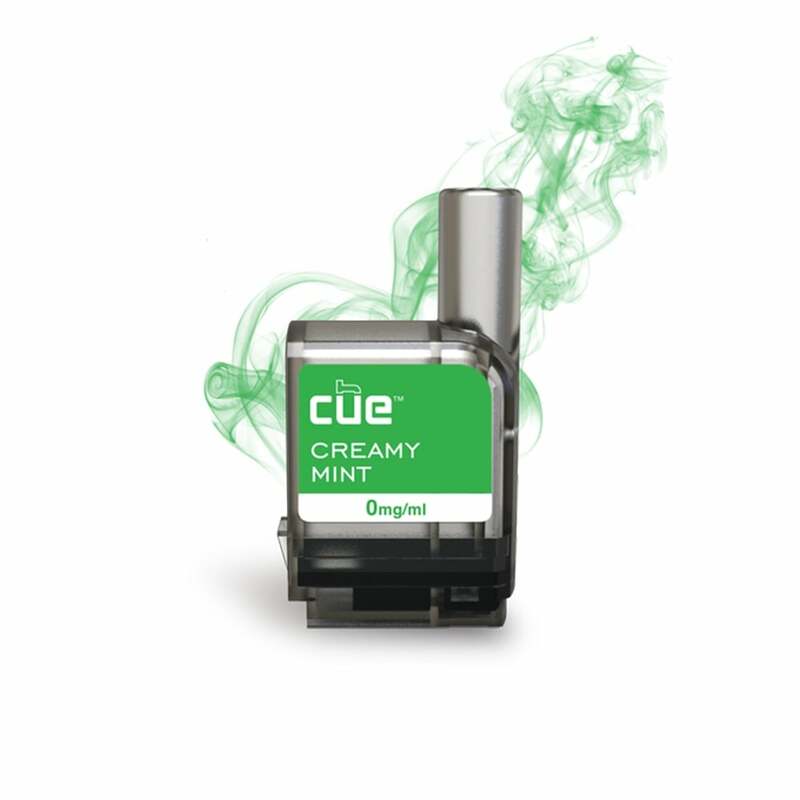 The creamy part kind of overpowers the minty part, but the mint adds a smoothness that balances it out and makes it easier to vape than Vanilla Cream and Menthol Tobacco, both of which can be too harsh at times. Creamy Mint is never harsh and is definitely the smoothest, easiest, and most refreshing flavor. The next mint flavor Cue should make is a Peppermint Candy Cane flavor, which I think would be the perfect flavor for menthol enthusiasts like myself. Mine did not have anything but a burnt coconut taste! Not mint at all! This flavor is so good it's one of my favorites.. it's not too minty and it's just delicious! Not as strong flavor as the menthol tobacco, but just as smooth. Good just sometimes the flavor gets a little muddled but good. I bought in the 6 mg, nice flavor even for a non menthol smoker, got the flavor to inside my girl to vape instead of smoking cig. So far it’s working. I’m going to reorder. One of my favs. This company is great! And shipping is fast! My wife loves this flavor... SO MUCH BETTER THAN Menthol!